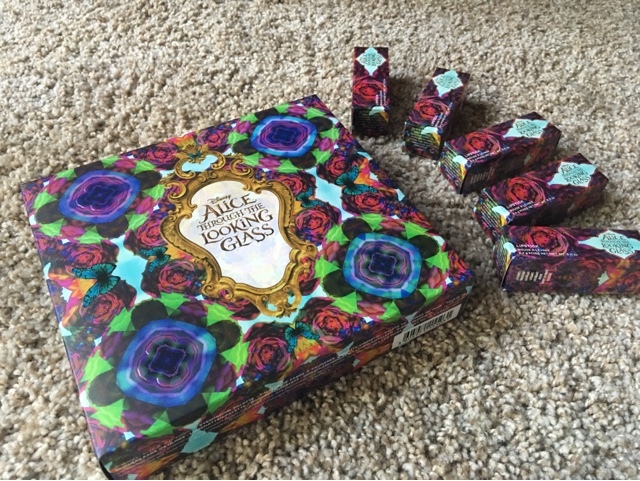 I HAVE THE WHOLE UD ALICE COLLECTION. IT'S SO BEAUTIFUL. SO MUCH COLOR. AHHHHHHH. LOOK AT THAT EMBOSS UGGHHH. Dying. But seriously, I was lusting after this thing so hard while doing collateral, and now that it's mine I almost don't even know what to do with it! But that's ok, I'm figuring it out as I go. 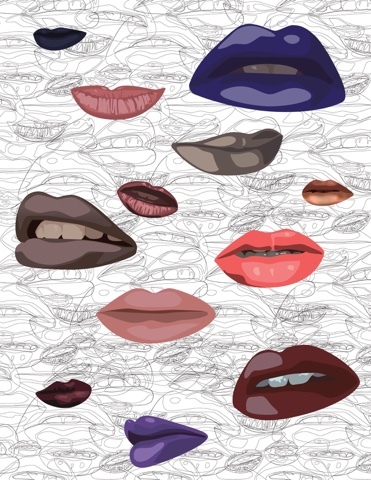 What's really neat is each column represents a character with a corresponding lip color, so naturally I started off with the middle! This is a super subtle color scheme, with really nice pinky-brown neutrals that complement the bold lip. This feels like a really nice everyday office sort of look for me. The lipstick is a gorgeous color, but the payout isn't as solid as a matte finish as its more like a slightly chunky cream. Not to say I don't like it, I love the metallic sheen to it, but I think I might use it more to ombré with something darker like Blackmail. 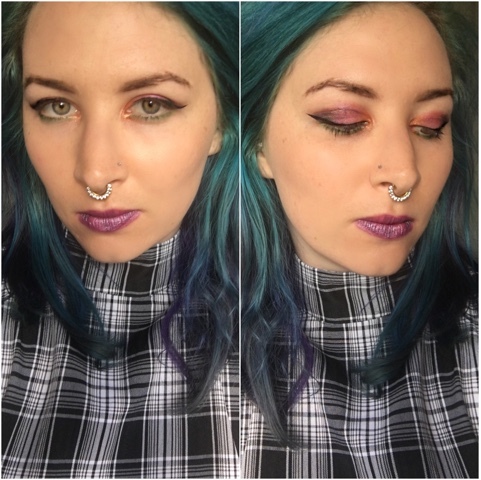 The next look I tried out was the Mad Hatter, using the mad hatter color scheme column and matching lipstick- this is also a metallized lipstick, so it basically had the exact same consistency as the Mirana color. This one would go really well over another matte color as well, I think layering these metallic colors over something more solid is really the way to go. 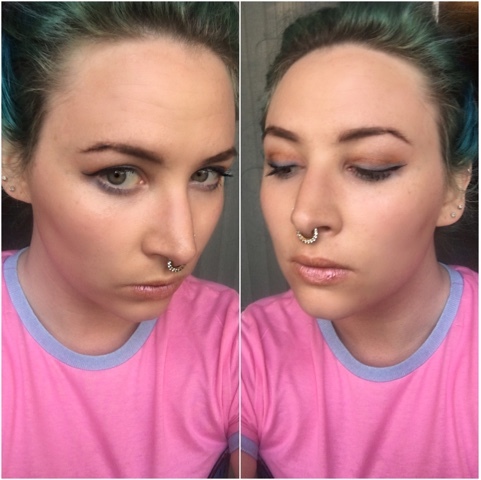 These eyeshadow colors are surprisingly wearable and coordinating, definitely not what I expected. When I see them in the palette I thought it would be a challenge, but I'm actually stoked with how this looks! 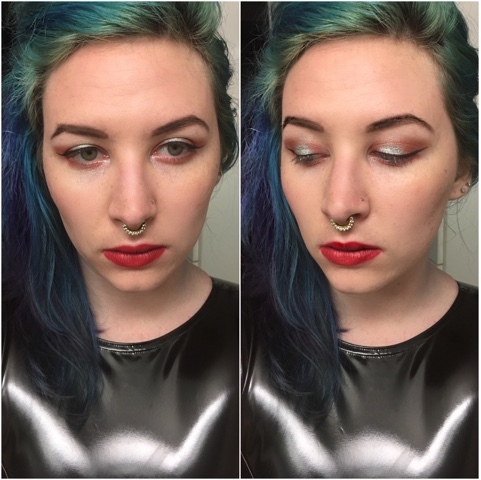 A nice bold color look, but I don't feel like I look crazy or drag-queen-tastic. 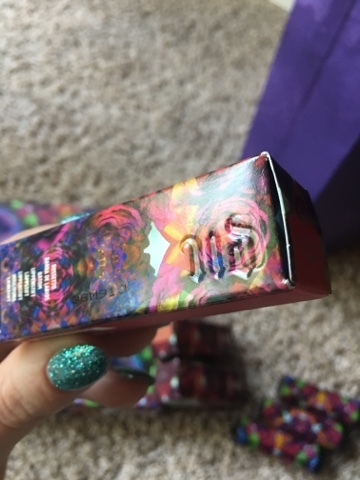 I was really looking forward to getting on that Alice lipstick, as it's sheer, but it has such a pretty iridescence to it I can't resist. It's definitely light, but it's nice and even and the shimmer is understated yet noticeable, especially in light. The only problems I'm finding with this palette so far is the color payout isn't as vibrant as I would like. I felt like I had to go over this blue color 16 times to get it to look semi-opaque, and even then it's really light. The pro is definitely blendability, but I almost feel like I'm blending some of these colors right off, or that the brush is taking more off than depositing on. Either way, I was a lot happier with this look than I thought I would be, so I'll def experiment more with some of these neutrals. Ok, I did this Red Queen look like four times cuz it just was Not working- I used all four of her shades first, but the blues made me look way too cracked-out kind of crazy. Then I did just the red with a highlight, but the red wore off before I could get a pic, then I tried it again and brought some of the other neutrals from the palette into the look, and then I tried just the red, highlight color, Duchess from the White Queen colors, and used Sugarpill's Grand Tiara and was finally content. The red really isn't as bright as I would like it, and it was the color I was most excited about trying. Buuuut OMG, this Iracebeth lipstick is my new favorite red, I love it so much! 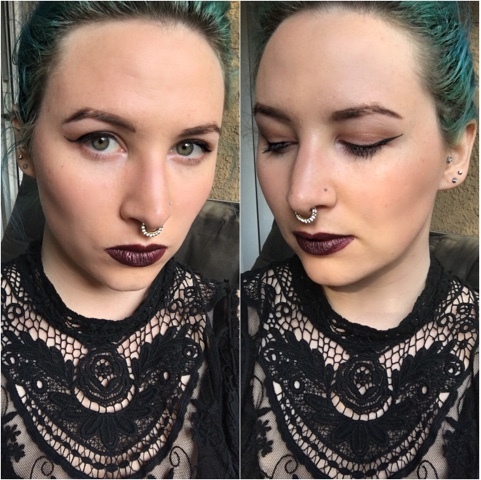 You can get a fairly crisp line without liner, it lasts for ages, and it's a super nice matte that just looks flawless. The reapplication was hardly an issue, it's so damn even, and the color is so gorgeous- it's somewhat pinky compared to my other reds, and I definitely cannot get enough of it! If nothing else, the Red Queen's look may have been a disappointment, but this lipstick is everything. It's funny cuz this is the one I was lest impressed with initially, cuz really, how many red lipsticks do I seriously need? Well one more apparently. Finally there's the Time color scheme and lipstick--- this was definitely the look that called my name. 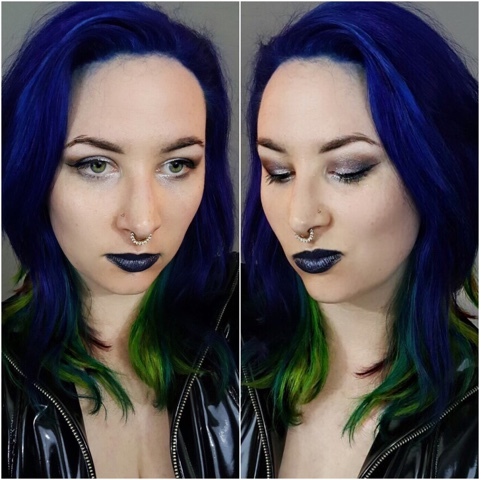 This lipstick-slate gray blue metallic- held all the excitement for me by a mile and I couldn't wait to get it on, so it's actually the look I test-drove first. Unfortunately I really didn't like the result, so there's no photographic evidence of that trial. Like I mentioned with the other metallics, this definitely is not as opaque as I was hoping and I decided to try it out over a similar colored matte lipstick to give it some really solid depth. These eyeshadow colors also start out decently dark and intense, but they wear off so easily I was really surprised by how everything looked by the end of the day.